Your DIY guide to higher performance and profitable growth by building a resilient organizational culture. By 2025, 75% of the workforce will be Millennials. Most of them have no interest in traditional corporate cultures – they will start their own company or freelance. 50% of workers will consider themselves in some form of freelance status by 2020 – freedom is the top quality desired by younger generations. Deloitte’s 2017 Human Capital report, executives rated “creating the organization of the future” as their most important challenge. Corporate cultures must evolve to align with today’s employment market and workforce if they hope to survive. The Culture Builder Toolkit is based on our work teaching and guiding transformational change for almost 20 years. It is designed to help you build a workplace culture where great talent wants to stay – the Toolkit is our documented how-to guide on what works. The Culture Builder Toolkit is the process we have used in our consulting work in large and small companies. We wanted to provide solutions for the too-common problem of workplace cultures that can’t keep pace with modern workforce demands and needs. The Culture Builder Toolkit is a road map for how to implement culture change. 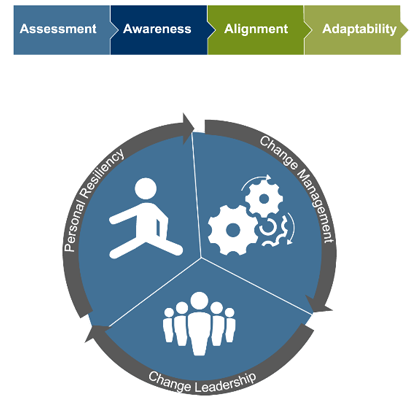 Our tool makes culture change accessible to any size organization. It was built around sound organizational change management principles, applied to leadership development and company culture. What Is The Culture Builder Toolkit? 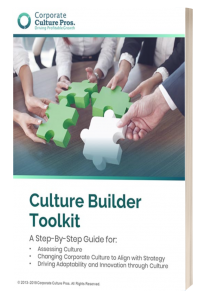 The Culture Builder Toolkit is an electronic, user-friendly 219-page PDF guidebook detailing 4 step-by-step stages for culture work. It is based on road-tested strategies, tools, and tips for designing and executing a start-to-finish cultural change or culture building process in your organization. This Toolkit will show you how and what actions make strong organizational culture an enabler of business growth, aligned performance and productivity. Clarity – Mission and purpose-driven companies are the future. “Make tons of money for shareholders” is not a mission or noble purpose. Communicate to build trust – Leaders of the future are always looking toward the future and innovation. They inspire trust and foster growth in people. Collaboration – breaking boundaries to inclusion is a structured activity. The organization of the future knows it well. Customer focus – Everything centers around the customer. Expert proven road map for building organizational culture and implementing change. A 30-question assessment to help you identify your unique barriers to performance. How to engage the senior leadership team effectively. 5 core habits that define a truly great workplace, and tools to implement them. How to define the cultural behaviors that best support the execution of strategic changes in the business. Tips and tools to help all change initiatives stick. Tap employees as corporate culture champions. The Iceberg, The Human Element & Are You Ready to Move to Awareness? The Iceberg, The Human Element & Are You Ready to Move to Adaptability?